Karim El-Basyouny, PhD, P. Eng. Welcome. This website was created as a way for people to find out about my work in Transportation Engineering at the UofA. The website offers a variety of content including information on my past and ongoing research, teaching, and service activities. The website can also be used to find recruitment announcements as well as requirements for graduate and undergraduate students to join my research group. I hope you enjoy the content of the website and please do not hesitate to get in contact with me if you have any questions. The recently created Urban Traffic Safety Chair is a one-of- a-kind academic posting for traffic safety engineering in Canada. Created thorough a permanent endowment from the City of Edmonton at the Department of Civil and Environmental Engineering, University of Alberta. Every four hours one person dies and every ninety minutes another person is being admitted to a hospital as a result of traffic collisions on Canadian roads. The goal of the Urban Traffic Safety Chair is to work collaboratively with the City of Edmonton to establish and maintain sound scientific practices in the area of traffic safety. One of the most rewarding aspects of an academic position is the opportunity to teach and interact with students. To work with each student to create a long-term training plan, which is centred on each student’s career goals . I base my teaching philosophy on four pillars: participation, pragmatic links, communication and integrating research and teaching. 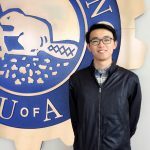 My research interests are centered in the general areas of transportation engineering with particular attention to traffic safety, and more recently on the role of intelligent transportation systems in improving safety. I have a strong commitment to train and supervise multiple HQPs in critical areas of transportation engineering and to support their career development. My past and ongoing research has focused on several areas leading to multiple contributions published in prestigious journals and international conferences. Solid HQP supervision and training is vital for Canada’s innovation and economic growth. HQP supply the labour market with highly skilled workers and helps in the diffusion of advanced knowledge. 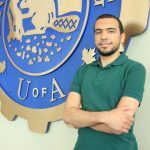 Maged Gouda is currently pursuing his Master’s degree in Transportation Engineering at the University of Alberta, and he is also a research and teaching assistant. His thesis research is focused on determining the time and distance halo effects of automated photo enforcement. Danyang began his MSc in September 2015 under the direction of Dr. EI-Basyouny. He completed his BSc in Southeast University, China in 2014 and then worked as a stuff in Student Affairs in South University from 2014-2015. His main research focus is on Traffic Safety Analysis. Suliman Gargoum earned his Master’s degree from the UofA in 2015. He currently is a Research and Teaching Assistant at the UofA, while also working towards obtaining a PhD degree. His thesis research is focused on the applications of LiDAR technology in highway engineering. 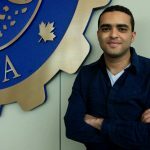 Mostafa completed his Master’s degree from Ain Shams University in 2014. He is currently pursuing his PhD degree at the UofA. 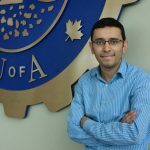 His research is currently focused on investigating the application of connected vehicles on improving driver behaviour to improve safety and mobility. 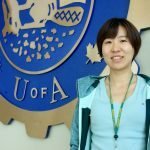 Yang (Naomi) Li has been a PhD student in Transportation Engineering at UofA since September 2014, working under the joint supervision of Dr. Kim and Dr. El-Basyouny. Her current research focuses on developing optimal resource allocation strategies for speed management programs. All published or submitted articles were sent to internationally recognized and acclaimed top-tier transportation journals.